No matter how bizarre its premise may seem, Persona 4: Dancing All Night is actually one of the most sensible and logical pretexts for a Persona spin off. The Persona series, and especially Persona 4, is known for its excellent soundtrack- and so, is it really that much of a stretch to have a rhythm game based on it? Persona 4, along with its various spin offs and adaptations (Persona 4 Animation, Persona 4 Arena, Persona 4 Golden, Persona 4 Golden Animation, Persona 4 Arena Ultimax, and Persona Q: Shadow of the Labyrinth) collectively have more than enough musical material to be able to do a full track list for a rhythm game too- why, then, does it seem so absurd? Maybe a lot of it has to do with the fact that, yet again, Atlus has tried to shoehorn a story into the proceedings; and not only does that story exist, it is also apparently canonical, taking place roughly a year after the events of Persona 4 Golden, and finding our heroes facing their most contrived challenge yet. Maybe it is because of the quality of writing, which has plummeted dramatically not just from the excellent standard in Persona 4/Golden, but also from Persona 4 Arena/Ultimax, where it was pretty poor to begin with. This poor story and writing should not detract from what is otherwise a rather excellent rhythm game. The issue is that it really does, and even when you avoid it by sidestepping the story mode altogether, you do find yourself running into a fair few other issues that hold the experience back from being everything it could have been. "It’s a ridiculous premise, and it doesn’t get better. It is not helped by the terrible writing; the Persona 4 Arena games had some pretty contrived and terrible setups too, but their overall quality of writing was far better than what is on display here." I guess I’ll just get the story mode out of the way here first. Set roughly a year after the Golden epilogue in Persona 4 Golden, the story begins with Yu Narukami and his friends helping Rise and her comeback concert, by being backup dancers. Rise’s ‘rival’ from Persona 4, Kanamin, is also introduced here, along with her group, since she’s also performing at the same festival that Rise’s own concert will be held at. However, pretty soon, things go south- a rumor of a mysterious video on this musical festival’s website starts circulating, which apparently pulls people into an alternate dimension. Yu Narukami, Rise, Kanamin, and everyone else find themselves on the other side, assuaged by shadows that they cannot fight, meaning their only course of action here is to dance their way out, since dancing somehow enraptures the shadows, and subdues them. It’s a ridiculous premise, and it doesn’t get better. 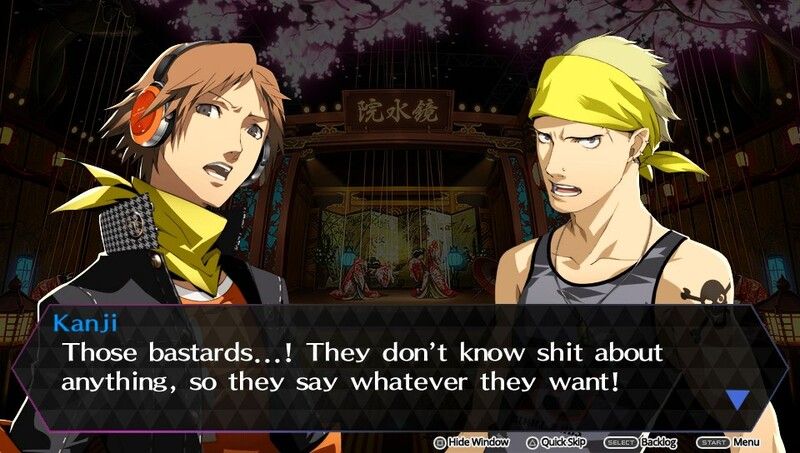 It is not helped by the terrible writing; the Persona 4 Arena games had some pretty contrived and terrible setups too, but their overall quality of writing was far better than what is on display here. The dialog here is frequently cheap, reducing characters to less than even the one note caricatures that the Arena games reduced them to, and is many times cringe inducing. This same issue continues to pervade the entirety of the 8 hour story mode, as the game tries to find believable reasons to shoehorn not just the entire Investigation Team from Persona 4 into the ‘other world,’ but also tries to fit Kanamin and her troupe into the mix, as well as completely unrelated characters such as Nanako and Dojima. It also does not help that it takes itself so seriously, and that there is so much of it, with there often being as much as 40 minutes of dialogs between gameplay segments. The story mode, then, is terrible, and inexcusably so. Happily enough, it is also mostly inessential. The ‘Free Dance’ mode (where you can jump straight into dancing without having to endure any of the poorly written dialog) exists largely independently of the story mode. You just pick a song, pick a difficulty, and you dance. As you complete more songs, you unlock more songs, and completing them on higher difficulties unlocks more partners for you to pick from per song (you are limited to one pre-determined character per song who is your main dancer, but you do get a backup dancer of your choice). "The actual rhythm game mechanics of Dancing All Night are great, and can easily pull even someone who isn’t necessarily too into these kinds of games in." The actual rhythm gameplay is very well done- it’s a multi rail system, meaning button input prompts are flying all over the screen (so there’s actually a fair bit to keep track of), and you have up to six different button presses, as well as analog stick ‘scratching,’ to potentially keep track of and time. Actually just hitting each note is not difficult- the game is very forgiving in that regard, meaning the only way you really miss a note is by not pressing its corresponding button at all. 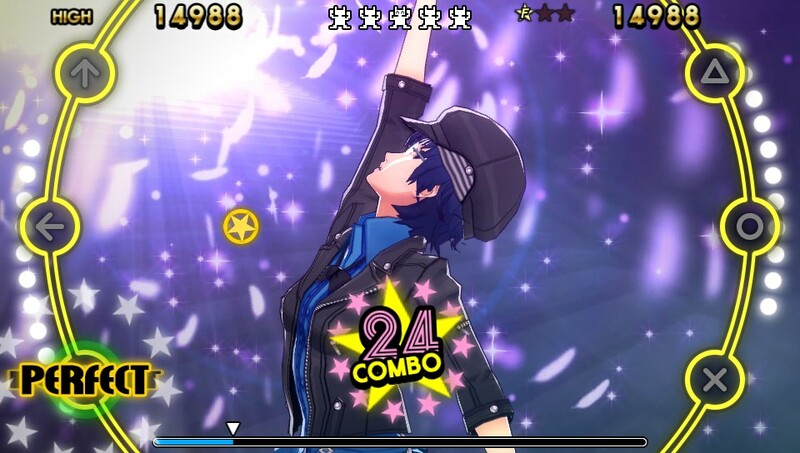 The true challenge in Persona 4: Dancing All Night comes from trying to score perfectly timed hits; not only are these necessary to achieve full combos, but on later tracks, notes are thrown at you in such quick succession that not hitting a note perfectly will mess up your timing and cause you to miss several of the following ones. 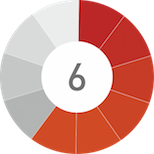 The challenge is only made greater when several of the more sophisticated notes, which require you to press multiple buttons at once, or to press and hold buttons, are thrown into the mix. It’s extremely addictive, too- I’ve stayed up so many nights now, trying to score a Full Combo on some song that I like, or maybe achieve the King Crazy rank (the highest you can attain), or, on higher difficulties, simply trying to actually clear the song before being thrown off the stage mid way (yes, that can happen, and when you are dancing with Nanako to the Junes theme, her disappointment and guilt at letting her ‘big bro’ down with her dance is heart rending). The actual rhythm game mechanics of Dancing All Night are great, and can easily pull even someone who isn’t necessarily too into these kinds of games in. If you can actually pull your eyes away from the frantic rhythm action, you will also find that Persona 4: Dancing All Night is a beautiful game. The high resolution models for all Persona 4 characters are great, and the colorful artstyle of the game really suits them. 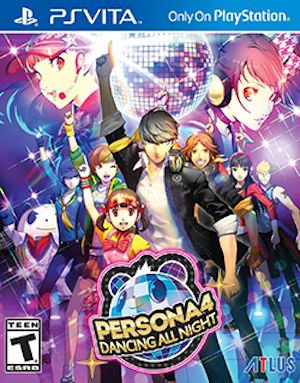 This is also accompanied, naturally, by a great soundtrack- Persona 4: Dancing All Night takes some very obvious, and other unlikely, songs and musical pieces from Persona 4 and related media, and turns them into dance numbers, with remixes that are largely top notch. "I really want to spill effusive and wax eloquent about the soundtrack here, especially since what we get is so amazing, but the issue is, there is not a whole lot of it." I really want to spill effusive and wax eloquent about the soundtrack here, especially since what we get is so amazing, but the issue is, there is not a whole lot of it- there are 25 tracks available to you here that you can unlock simply by playing through the Free Dance Mode (another two are gated behind the Story Mode, meaning you do need to complete the Story Mode entirely if you want the full track list), but even at 27 tracks, there is simply not enough on offer here, especially considering the richness of the source material. Major popular tracks from Persona 4 and associated media are entirely missing, including some obvious picks, and a lot of the tracklist is comprised of just repeats (there are at least four different songs that have more than one version). A lot of this is going to be addressed with DLC, free or paid, and indeed, there will be a fair bit of DLC available to you on the first day itself to download, including music from the Persona 4 anime, but that does not address the issue of a lacking tracklist in the base game itself. This is a pretty major issue, especially since this is a rhythm game, and also because this leads to a paucity of content in the Free Dance mode, meaning sooner or later, you will find yourself having to tackle the Story Mode, and the Story Mode is simply atrocious. 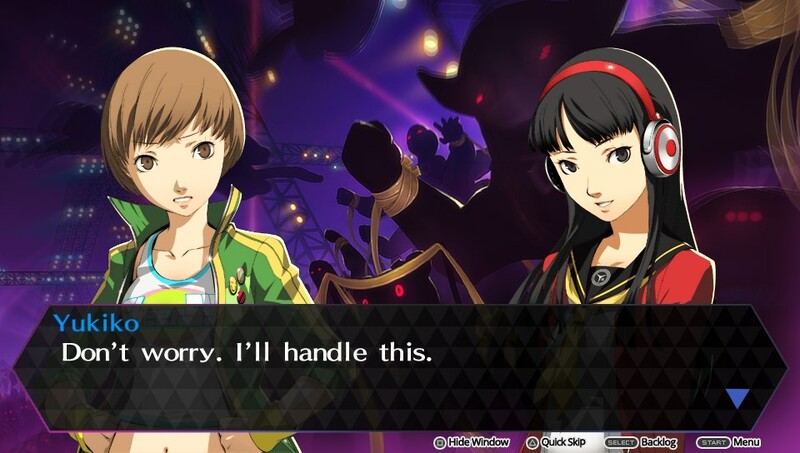 It’s a pity about these issues, too- as I said before, Persona 4: Dancing All Night as a concept is simply too perfect, and the opportunity to see Chie or Kanji rocking it to my favorite tunes from the games (in costumes that I get to pick for them, no less!) is appealing to me. The problem is just that there is not enough here, and a lot of what we get is simply terrible. Maybe if the story mode wasn’t so awful, the short tracklist wouldn’t be as much of an issue (though it would always be a missed opportunity), or maybe if the tracklist wasn’t so short and lacking, it would have been easier to digest the awful story mode- it’s a chicken and egg situation. Be that as it may, what we have here is a game that gets its mechanics wonderfully right, but almost everything else around it wrong. I don’t like the fact that I get such a short tracklist, and that so much of what I do get is repeats. I don’t like the terrible writing in the Story Mode. I don’t like the fact that I will have to buy more DLC to have enough content to continue playing this game. I may keep playing Persona 4: Dancing All Night, but there is a shocking lot of it, really, that I really do not like. What we have here is a game that gets its mechanics wonderfully right, but almost everything else around it wrong.